Current Offerings - Bluegrass Thoroughbred Services Inc.
We take great pride in our reputation as respected consignors of yearlings and breeding stock. Offering horses at public auction is a detail-oriented process, requiring careful preparation prior to, during and after the time of sale. Buyers have high expectations of our consignments and we work closely with each and every client to ensure potential buyers are provided all pertinent information. Our ultimate goal is to find the right buyer for every horse we offer. We would love the opportunity to sell your horse to its full potential! 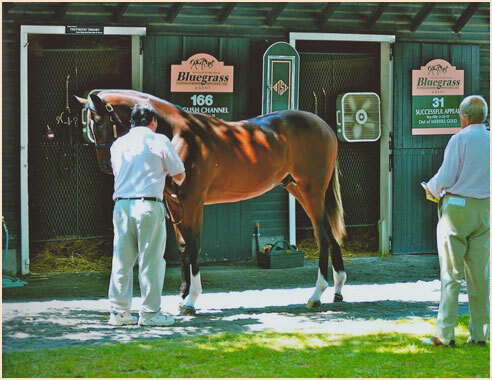 If you have yearlings & breeding stock you would like to have inspected and evaluated for future potential sales (Fasig-Tipton July, Saratoga & October and/or Keeneland January, September, November), please email us: sandy@bluegrasstbred.com. We look forward to hearing from you.